NobelSport is known mostly in Italy for their sport shooting ammunition lines which include a robust shotgun line suitable for everything from field grade to ultra-match, but they have ventured into the American market with strategic offerings aimed at the American consumer. 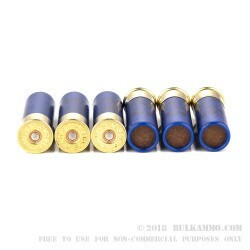 This LE 12 gauge variant is a prime example: It features a #4 buck shot in a 27 pellet offering *(2 ¾” shell) with a high base and a high quality build. 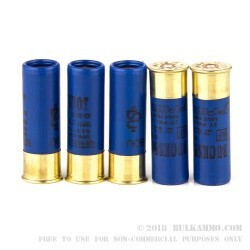 The high base doesn’t hang in shotguns of any type and the paper end cap and plastic wad keep the shells in good condition for those that might want to reload. 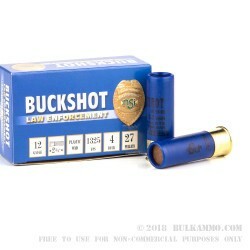 The 1325 FPS out fo the muzzle offers good sporting opportunities, and this shell stands out as a turkey or pig load if you prefer wild game to law enforcement duty or self-defense uses for the shotgun. It recoils moderately for the load but not excessively, and it still offers enough power out of the bore to function most semi-auto shotguns without significant adjustment. 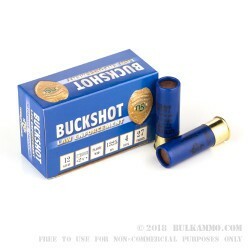 The #4 shot gives very good patterning out to about 50-75 yards, with the best case scenario at between 15-60 yards for hunting and self-defense. As for number 4 shot in a home defense scenario, the compaction of spread will incapacitate most threats in the short distances but still offers some protection against over penetration.